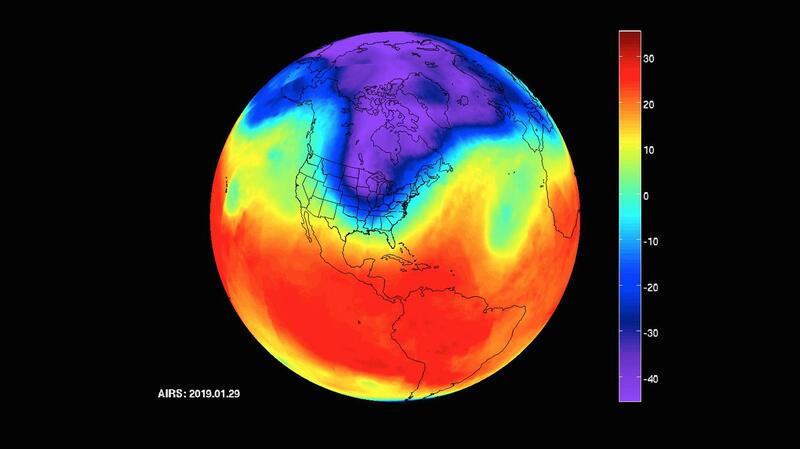 NASA's Atmospheric Infrared Sounder (AIRS) instrument captures a polar vortex moving from Central Canada into the U.S. Midwest from January 20 through January 29, 2019. The images show air temperatures at 600 millibars, around 2.5 miles (4 kilometers) high in Earth's troposphere. 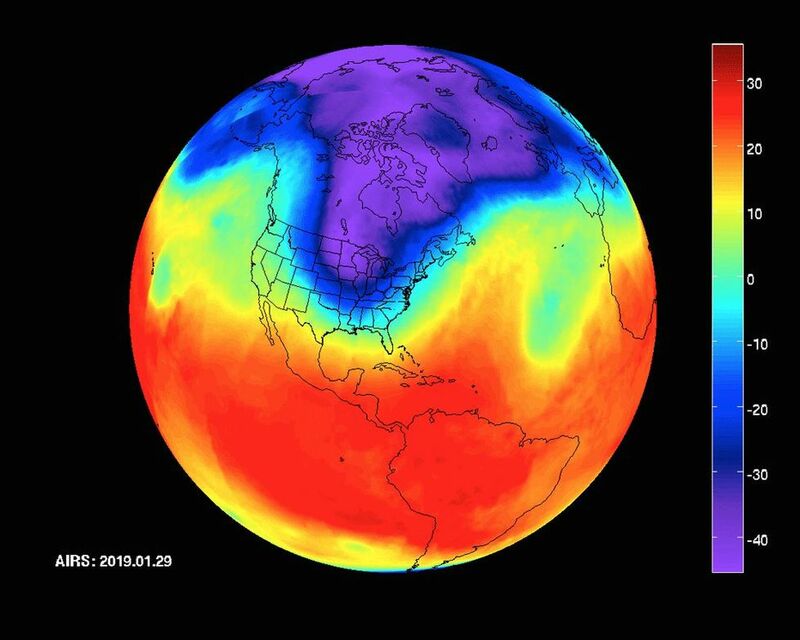 This polar vortex is responsible for surface air temperatures as low as -40 degrees Fahrenheit (also -40 degrees Celsius) and wind chill readings as low as the -50s and -60s Fahrenheit (-46 and -51 Celsius). 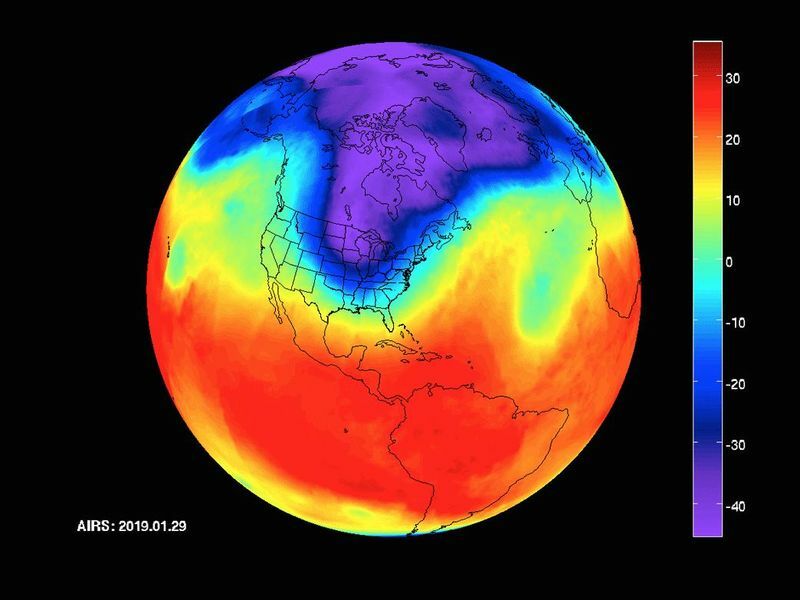 AIRS, in conjunction with the Advanced Microwave Sounding Unit, AMSU, senses emitted infrared and microwave radiation from Earth to provide a three-dimensional look at Earth's weather and climate. Working in tandem, the two instruments make simultaneous observations down to Earth's surface. With more than 2,000 channels sensing different regions of the atmosphere, the system creates a global, three-dimensional map of atmospheric temperature and humidity, cloud amounts and heights, greenhouse gas concentrations and many other atmospheric phenomena. Launched into Earth orbit in 2002, the AIRS and AMSU instruments fly onboard NASA's Aqua spacecraft and are managed by NASA's Jet Propulsion Laboratory in Pasadena, California, under contract to NASA. JPL is a division of the Caltech in Pasadena.